It is with dismay and disappointment that right-minded citizens greeted the news that the Ampang Jaya Municipal Council (MPAJ) had given its approval for the construction of the East Klang Valley Expressway (EKVE) today (The Star, 20th Aug 2015). 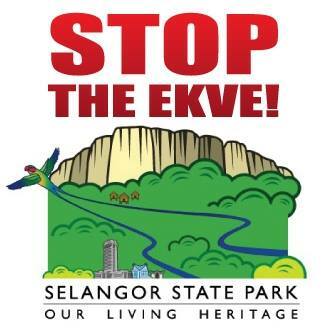 This proposed expressway project would have far-reaching consequences that go beyond the boundaries of Ampang and would adversely affect the water supply and air quality of Selangor residents, as well as destroy and fragmentise wildlife habitats. The decision of the council, which brushes aside the entirely valid concerns of citizen action groups, environmental organisations and the scientific and conservation community, makes a mockery of the concepts of transparency, democracy and participation in Local Agenda 21, which the municipal council and state government claim to be committed to. It has often been reiterated that the Ulu Gombak and Ampang forests, which the EKVE will cut through, are vital carbon sinks and water catchment areas. The destruction of even a part of the Ulu Gombak and Ampang forests will result in more dry spells and poorer water and air quality for Selangor residents. Furthermore, once the state government has gone down the slippery slope of forest degazettement, it will find it easier to justify the degazettement and destruction of a wider and wider area, and inadvertently create opportunities for unscrupulous developers, vandals, poachers and profiteers to enter into, plunder and destroy previously inaccessible forested areas. The aforementioned forests are also part of the Selangor State Park, gazetted with the objective of protecting air and water quality, biodiversity and local climatic stability. The state government’s readiness to degazette a state park does not bode well for the future of other remaining green lungs and forested areas in Malaysia. Proponents of highway construction often rely on the argument that highways will alleviate traffic congestion and thus ultimately improve the quality of life of residents and reduce carbon emissions. This logic is ridiculous, because the solution to the problem of traffic congestion is not to build an ever-increasing number of roads and highways, but to improve the public transport system and improve road safety for public transport users, cyclists, and pedestrians in order to encourage people to choose alternatives to private vehicle ownership. We have the infrastructure for an efficient public transport system in Malaysia, but not the political will to make the system reliable, punctual, convenient and safe. Improving road safety and the public transport system will use less public funds and take less time to implement than constructing more highways and roads. Since the parties concerned have already given their approval for the construction of the dreaded expressway, any objection at this point may be purely academic. There is apparently a list of conditions drawn up by the Drainage and Irrigation Department, Public Works Department, and MPAJ’s Planning Department to be adhered to in the construction and management of the said expressway. It is hoped that these documents will be made available for public viewing, and there must be a check-and-balance system to enable citizens to determine compliance with these measures and provide feedback on the same. 5. That the project incorporates design elements such as solar-powered lighting and the planting of indigenous trees to act as a noise-absorbing wall along the expressway. It must be admitted, however, that compliance with all the above requirements is still a weak substitute for scrapping the expressway project altogether. The haste with which approval was given, and the betrayal of trust by the authorities when they had previously assured the local residents that the Traffic Impact Assessment would be made available to them, reflect poorly on the state government, contractor and agencies involved in this controversial expressway project, and raise concerns that the parties concerned will just bulldoze through with this project with equal disregard for human residents and the natural environment. All state and national efforts to encourage and reward environmental sustainability and citizens’ participation in public interest matters amount to nothing more than greenwashing and lip service if projects that cause significant and irreversible harm to the environment such as the EKVE are approved with such outrageous haste and recklessness.